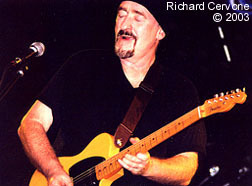 Legendary songwriter/guitarist Dave Mason was the subject of a cover feature by 20th Century Guitar Magazine in 2003. 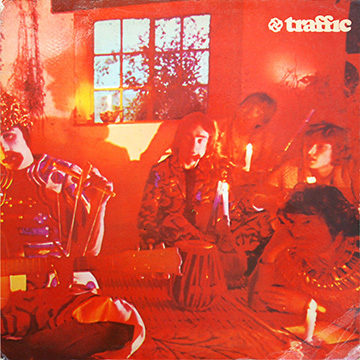 Dave was a founding member of the famous West Midlands group Traffic along with Jim Capaldi, Steve Winwood, and Chris Wood. 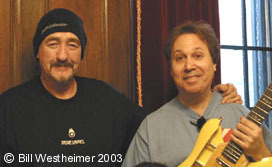 While a member of Traffic, Dave Mason composed some classic songs for the group including the psychedelic masterpiece Hole In My Shoe which was a top U.K. chart hit for the band in 1967, and Feelin' Alright, a song that has been covered many times by other artists. Dave had re-located to the United States by 1970 where he has since enjoyed a long and successful solo career. Rob: I was reading that in 1963 you were a member of a guitar combo called The Jaguars? Dave: Oh that was my very first band. Rob: Speaking just for a minute of '60s pop instrumental music, were you influenced early on by Hank Marvin and The Shadows? Dave: When I started, I used to think the vocals got in the way. Rob: So The Shadows were a big influence. Dave: Oh, huge. The Shadows, The Ventures, The Hunters... Rhett Stoller. Rob: Can you mention any of your other early musical influences growing up? Dave: From the get-go my musical influences come from hip pop, popular stuff. And then I backtracked into the blues, jazz and classical. I always had a pop sensibility. I mean I'm making records to sell em! (laughter) otherwise I would just stay at home. Rob: Any other early influences growing up? Dave: The Shadows and The Ventures. "Walk Don't Run", "Rambunctious", "Perfidia" by The Ventures. The Shadows... "F.B.I. ", "Man Of Mystery", "Apache". There were other more obscure things. A guy called Rhett Stoller. 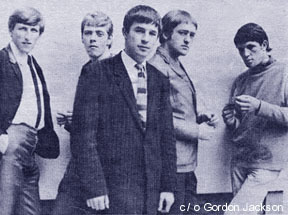 The Outlaws was a great instrumental band that Joe Meek produced some great instrumental records for. Great sounding records. 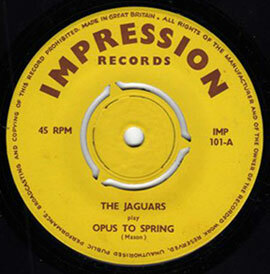 Rob: I remember Joe Meek's song "Telstar" and his work with The Tornados. Rob: After The Jaguars, you and Jim Capaldi were in an early band called The Hellions. Did that change the sound? Dave: That was a little more jazz. We were doing stuff like... it was musically, very eclectic. We were doing Beatles, Martha & The Vandellas, Oscar Brown Jr. It was all pretty eclectic. And the The Hellions was the next band. And that band... actually that was the first recording we ever did. And actually the first song I ever wrote was a song with Jim. It's on the flip side of a record... as The Hellions we did a record for Pye Records with Kim Fowley as the producer. Dave: He was the guy (Kim Fowley) who did "They're Coming To Take Me Away! (Ha Ha)". We did this Jackie DeShannon song called "Daydreaming Of You" and the song on the flip side of it was the actual first song that I'd written, Jim and I wrote, called "Shades Of Blue". Rob: Do you still remember playing guitar at Olympic Studios on the original Traffic version of "Dear Mr. Fantasy"? Dave: That's Steve Winwood. I'm playing bass and harmonica on that. Rob: Do you remember the guitars you used on the Mr. Fantasy album or is that going back too far? Dave: (laughter) They're probably Strats. Rob: So Steve Winwood played guitar on the Mr. Fantasy album? Dave: Steve played most of the guitar on the early Traffic stuff. And then the second one came out. I didn't really start playing anything worthwhile on guitar until I did Alone Together, actually. Rob: You must love playing live. Rob: In the liner notes of another great album you recently released on Sanctuary Records, Jim Capaldi said playing live with you was sort of like coming full circle. So what was it like playing with Jim on the Live - The 40,000 Headmen Tour CD? Dave: Actually the whole thing with that was were going to do an album and we cut a bunch of stuff but we went on the road. It was good, I mean I've known him since I was 15 or 14. He grew up around ten miles away from me and we were in lots of little bands together. But, it just got hard. Personally, it just didn't work out. So he went back to England. It's a shame really. It just didn't happen. The ideal thing, the smartest thing for any of us to do would be for me, and Steve (Winwood) and Jim Capaldi to do a reunion album. A Traffic thing. I mean, if I had a dollar for everybody that asked me, "is it gonna happen? ", I'd be wealthy. I don't know... it just can't. At this point it just doesn't seem to want to work. Which is a shame. But it's too bad they don't want to do it. That's a drag. There's alot of bands out there, The Eagles. I mean there's a lot of guys that've got all kinds of sticks up their butts about each other who can at least get together on the stage to make some music. We did do one thing. Steve came when we were at The Bottom Line. Was it two years ago? About two years ago. Actually George (Harrison) came down. That was the last time we saw him was at the Bottom Line. But Winwood came down just for one show and got up on stage and did a couple of songs with us. I mean the crowd went nuts. I mean just for that reason alone it would be great to do, in London. Rob: I understand you have some newer and more recent songs which haven't yet been released. Dave: I mean, I don't have a lot of stuff. Like most of the albums that were done, what I finish up writing usually gets recorded. If I don't finish it's because I don't think the song is good enough to make it. So, it's not like I have a whole big backlog of stuff. I don't. I mean it took me two years to write those eight songs on Alone Together. I'm not, I won't say extremely prolific, but I try to write stuff that will last a long time.